Around this time of the year, I’d normally be preparing to go back to work as a high school English teacher. 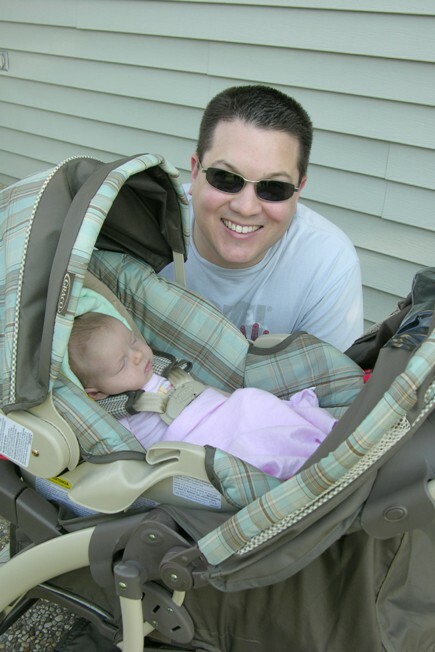 However, we decided some time ago that I would be a stay-at-home daddy after the birth of our baby daughter. Emma arrived on July 9th, and so my new adventure as Mr. Mom begins! Luckily, I’ve had quite a bit of on-the-job training from Kristen, my parents, and my in-laws, so I’m feeling confident. Emma and I even had a couple of practice runs on our own over the last few weeks, and other than a few shots of poo to the chest, we both survived just fine. I’d like to wish the students and faculty of Bloomington High School a fun, safe, and productive year. I’ll be thinking of you all. This entry was posted in Author News, Opinions/Editorials and tagged baby, Bloomington High School, dad, daddy, english, family, high school english, high school english teacher, mr. mom, new parents, parenting, stay-at-home daddy.